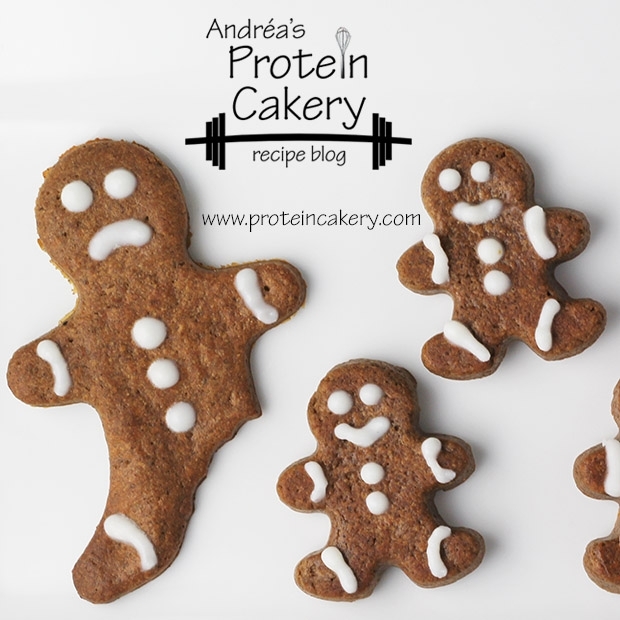 Crisp and full of flavor, these gingerbread protein cookies are sure to be a holiday favorite! Mix cashew butter, 2 tablespoons of water, and molasses (or agave) until well combined. Add remaining ingredients, and mix well. If the dough is too sticky (sticks to your fingers), add 1 or 2 tablespoons more of protein powder. If the dough is too dry (and crumbles), add another tablespoon of filtered water. Chill the dough in the freezer for 10-15 minutes before rolling it out on a piece of parchment to about Â¼ inch thick. (If you don't have a rolling pin, press it out using the palm of your hand.) Cut into shapes using cookie cutters, and transfer cookies to a parchment lined cookie sheet or (unlined) dehydrator tray. Bake for 12-15 minutes, or dehydrate at 105F for about 18 hours. Ice with warmed coconut butter (optional, not included in macros). Place iced cookies in the freezer for a few minutes to set the icing. A note about substitutions: In this recipe, you might try substituting vanilla pea protein powder for the vanilla rice protein powder. Using whey would give it a very different (probably undesirable) texture.